A perfect spring morning brought along the beauty of life and hope as we piled in the Honda and drove south. It misted ever so slightly, stopped, and eventually gave way to warm, gentle sunshine. Traffic was light on the way down from Mt. Pleasant and the City of Alma was either nearly vacant or most of the residents were sleeping in. I suppose that’s to be expected before nine o’clock on a Saturday morning. We walked into a quiet building on the college campus marked with paper signs directing us to the “Amateur Radio Exam”. We had arrived about twenty-five minutes before the start time, surprising the lead examiner a little with our early arrival. He welcomed us and had us start on the paperwork as the rest of the exam team arrived, all of them seeming to be cheerful and glad to have people testing. Two more examinees showed up, rules were given, and we started. My lovely wife and my four brothers present passed the Tech exam. One of my brothers passed all three exams in one sitting, going from unlicensed to Amateur Extra. I teased him after the testing that he went from “zero to hero”. Everyone at the test site was quite impressed. I also passed the Extra test. We all used Hamstudy.org as our main exam prep resource. There’s nothing quite like practicing the actual test questions and knowing the exact questions on the exam. I also listened to Gordon West’s study CD’s for the Extra exam three times. It was nice having the question pool reinforced audibly. Passing the Extra exam was a strange feeling really, both happy to have passed and yet a little sad to be “done” “achieving” the next higher level. I guess I just like taking tests. There’s still plenty more to learn about radio though and I’m not done learning it. I’d like to get a HF transceiver, put up some antennas and try out the privileges I have available to me now. Until I do that, my next endeavor is learning CW (Morse Code). There’s always another challenge to engage in. It was a great day being with family and I enjoyed seeing my wife and brothers pass the exams that they had prepared for. Everyone had studied hard and was happy to pass. That was the best part really, to see my wife and little brothers have fun, learn, and succeed. May 21, 2016 Kevin M. PierpontComments are off for this post. Recently I obtained my General Class Amateur Radio License. Ham radio has always been something that was interesting to me, ever since I read a Hardy Boys novel where Frank and Joe used a shortwave radio. A few years later I read Alone by Admiral Byrd, who during his five month stay alone in the Antarctic used a radio to keep in contact with basecamp. As a young boy then I did’t know that people still used ham radio. Amateur Radio just seemed like some cool skill that would be fun, but I was just born too many decades late to do something like that. As I learned more about Ham Radio in the last couple of years I realized that ham radio was still alive and it wasn’t that hard to get licensed. It just takes some studying, and a desire to learn. KB6NU’s No-Nonsense guides for both the Technician and General Class Exams. You can download the PDF for the Technician Exam for free from Dan’s website. Ham Radio Podclass with Michael Dell and John Martin. Even though some of the material isn’t up to date it was still helpful to listen to. Hamstudy.org was by far the most helpful study resource for me. I worked through all the flashcards for both tests and took many practice tests. Being able to gauge my knowledge of the exam material gave me confidence on test day. Having a multiple-attack for studying with reading, flashcards, and listening to the Podclass and Gordon West was very helpful, and led to a better grasp and understanding of Amateur Radio. On the Technician test I scored 100%, and 97% on the General. The Volunteer examiners asked if I’d like to take the Extra exam also, since I had passed the first two exams. Even though I hadn’t studied for it, I gave it a shot. It would be a good chance to see what it was like. I scored 60% on the Extra, which wasn’t good enough for a passing score. You need a minimum of 74% to pass. With some more studying I would be within reach of getting my Extra Class license. Knowing that I was only 7 correct answers away from my Extra license, I realized I should study and take it while I’m still in studying mode. No better time than now to upgrade! I’m studying some everyday to get ready for an upcoming exam in a couple of weeks. April 11, 2016 April 11, 2016 Kevin M. PierpontComments are off for this post. We recently purchased a dark blue 2009 Honda Odyssey. So far we really have liked driving it. Clean, quiet, and smooth. The only thing that was strange was when we would drive the van around a corner – it sounded like there were marbles rolling around in the dash. There was a bit of noise when I turned the fans on high. It sounded a lot like acorns rolling around. Maybe mice liked our van too. The seller had stored the van in a barn for a few months before selling it and apparently mice seized the opportunity to chock the vent system full of acorns. 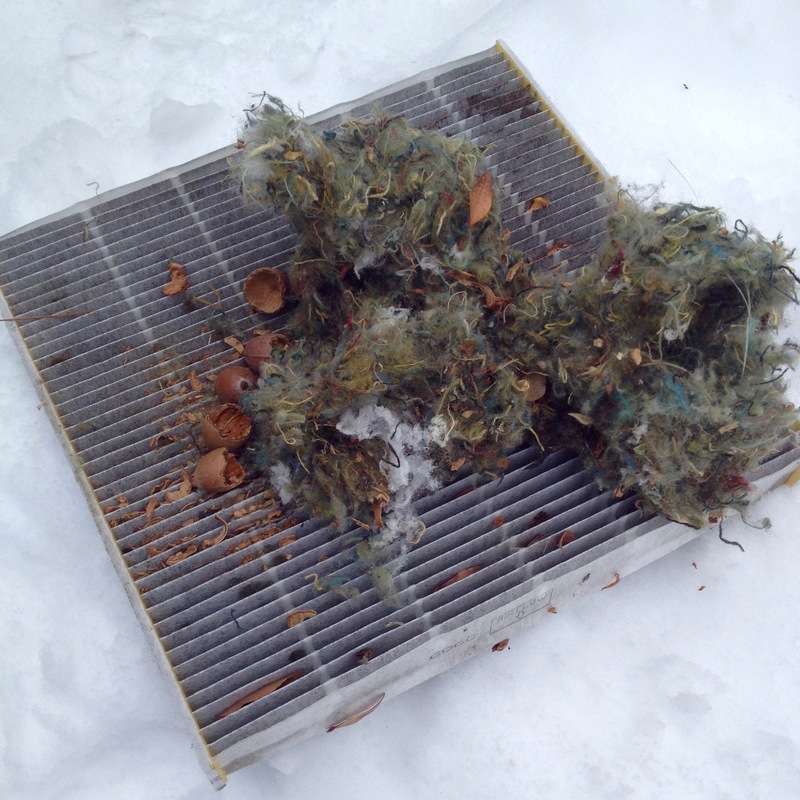 I figured the best place to start looking for what was making the noise was to check the cabin air filter. I watched a helpful instructional youtube video, and got down to the filter. Once I went to pull out the cabin filter I realized I had hit the jackpot. Acorns everywhere with a nice mouse nest on top! Wiggling the filter, it eventually came out. Acorns fell down around where the filter sits and I picked them out one by one. I got out the Shop-vac and got everything clean and replaced the old filter with a new one. Then I turned the vents on high. I heard more acorns rattling around somewhere. Rats! So I turned on the floor vents. The driver’s side floor vents started spewing out acorns. Kind of like when you put a five-dollar bill in a vending machine and get your change in quarters; they just kept coming out. I switched the vents between dash, floor, dash, floor, and out came even more. I then put the shop-vac hose end on the driver’s floor vent and sucked more out while continuing to switch the vents back and forth. There were bits of debris in the dash vents, so I used the shop-vac on those too. Hopefully I got everything out, but I’ll be using the shop-vac more to make sure to get it all out. I’m sure driving it will rattle a couple more out. So if you hear marbles rolling around in your dash, check for acorns! And maybe set a mouse trap or two. February 28, 2016 February 28, 2016 Kevin M. PierpontComments are off for this post. Summer is coming. With only 22 days between now and the start of the summer camp season at Barakel, things are busy and exciting. In the past few weeks I’ve kept busy with work around camp and with my studies. I tried something different and took two tests in one day. The tests were: “Intro to World Religions” and “Here’s to Your Health”. Although I was slightly nervous about taking two at once, I did well and passed both, praise God. I celebrated by making tacos for supper – smothered with hot sauce, of course. This past week I spent some time working on the zipline with Jeremy Linsley. 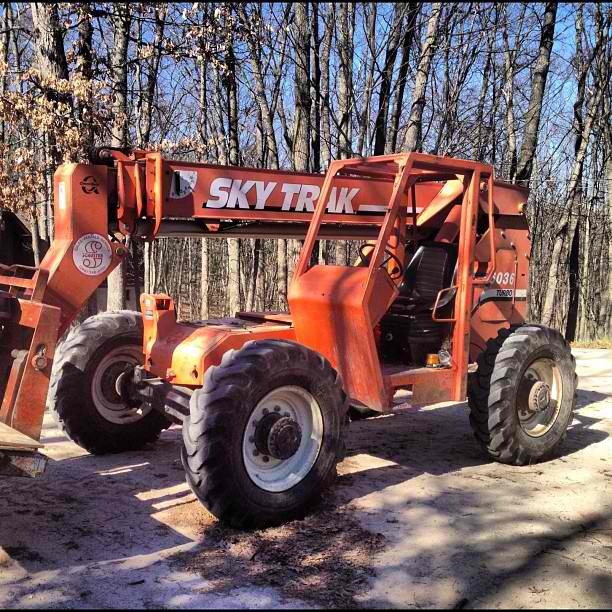 We used the Skytrak as our ladder and checked all the tightness of the clamps, and replaced worn out components. 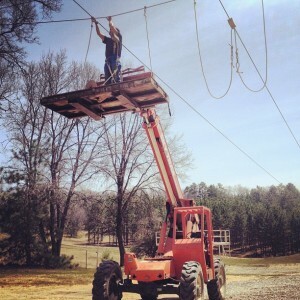 In a couple of weeks I’ll take part in zipline training so that I can help run it during retreats. Saturday was the first co-labor work weekend of the spring and we had a good group of eighty or so volunteers come up to rake leaves and clean buildings. I spent the day raking with a jolly crew most of the day. We cleared out all the leaves around three of the lodges. I finished up the day lifeguarding as a few brave folks jumped in the lake and some people went boating. All in all it was a wonderful day of rewarding work and good fellowship with the volunteers. Thank you all for your prayers and care! Continue to pray for the ministry of Barakel as we near a summer that will be full of oppurtunities for the Gospel to be proclaimed, and hearts to be changed. To God be the glory! May 7, 2012 Kevin M. PierpontComments are off for this post. Here are some highlights in pictures of the last few weeks. My family visited for a weekend. I passed a DSST test on “The Rise and Fall of the Soviet Union”. 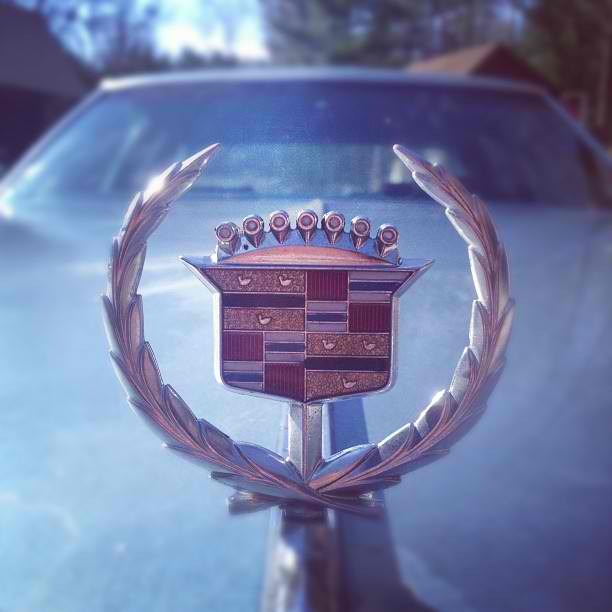 Camp got a “new” Cadillac to use for highschool weeks this summer. 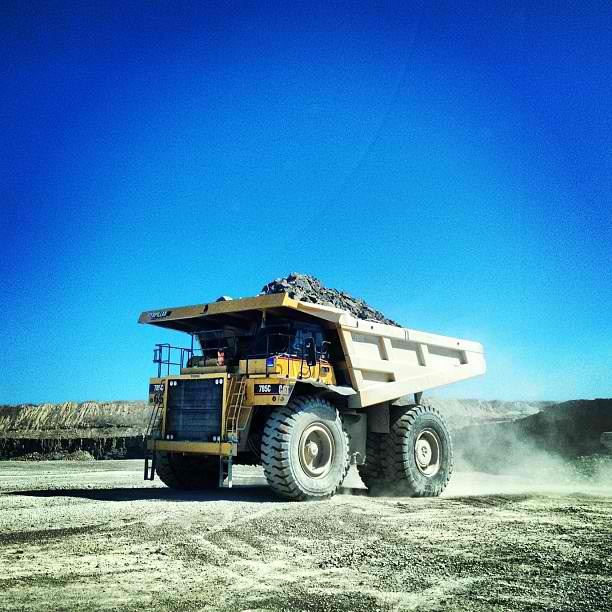 I got to see a limestone quarry near lake Huron. 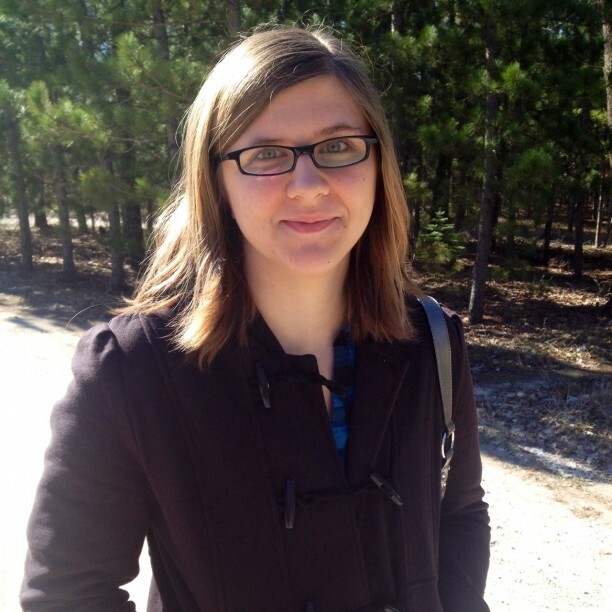 My sister, Kristi, came and visited for a few days this week. April 15, 2012 Kevin M. PierpontComments are off for this post. March came in like a lion this year, bringing with it our last winter retreat here at Barakel. 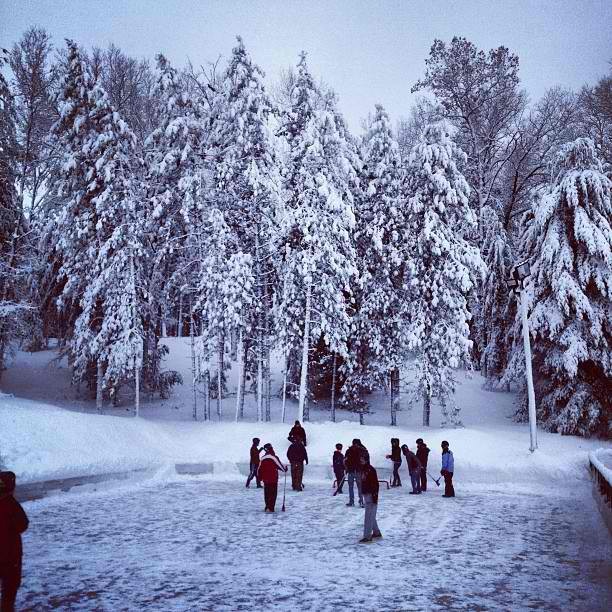 Snow began to fall late in the day Friday as the campers arrived and continued falling throughout the night. The snow was wet and heavy, and fell steadily. Nearly all the staff men worked around the clock keeping pathways, roads, and ice rinks cleared. Power was lost in the wee hours of Saturday morning. This didn’t stop camp’s activities as we have generators for Chapel and the Dining Halls, but it did result in campers having to go home early on Saturday evening instead of Sunday afternoon since we could no longer heat many of the lodges. The campers had a great time though, and I don’t think any of the campers or staff will forget the week of crazy snow and lost power. I took the following week off to go home, see family, and to visit friends, and enjoyed going to church at home on Sunday. It was a great week. 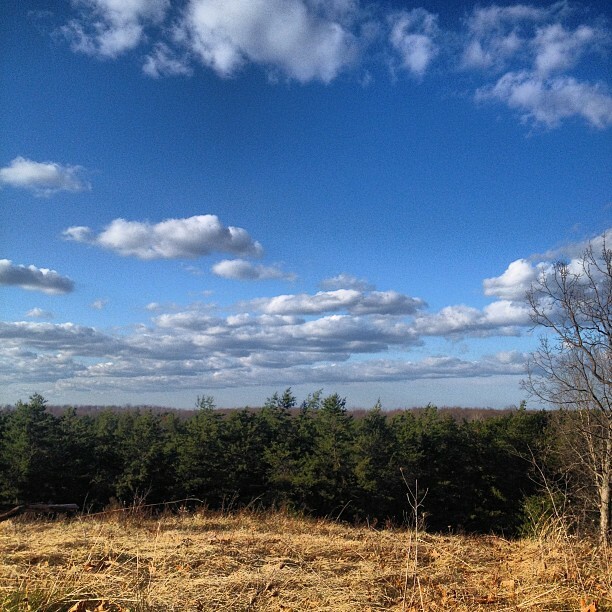 When I returned to camp I came back to summer-like weather with melting snow and clear, sunny, blue skies. Titus Brown at Eagle Point, where we camped. 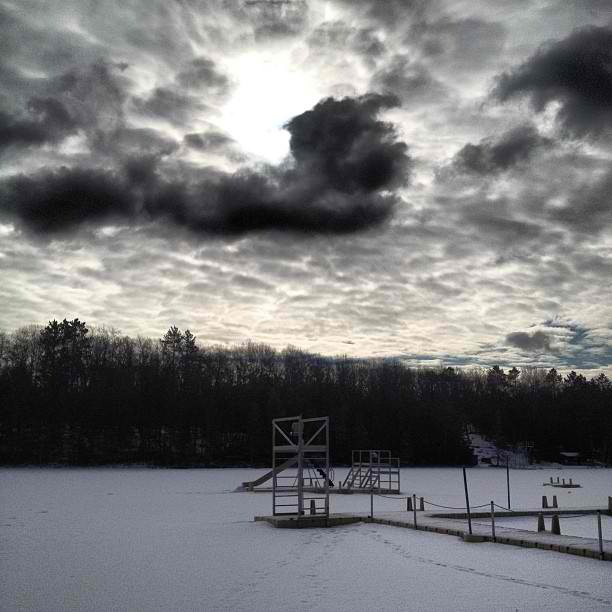 The lake was still frozen until this past Saturday afternoon when open water finally started appearing. The lake is totally clear now. March really feels like summer this year, and it’s strange. I don’t mind it though. I even camped out in Huron National Forest Friday evening and enjoyed the beautiful weather. I’ve taken two tests since I’ve last posted, both of them on history of wars: The Civil War and Reconstruction and The History of The Vietnam War. Studying war is a dark thing, but it’s good to know the past and realize the fallen state mankind is in without Christ. Now that winter retreats are over, we are cleaning up after the winter and getting ready for the spring and summer camping seasons. Today started “spring cleaning” with all of staff being assigned to various buildings to do a deep, thorough clean. Working with a group is a nice change and makes cleaning quite enjoyable. With everything we do at camp I keep remembering that summer is nearing, and it’s exciting. Summer brings with it campers and many opportunities to share the gospel with them. Pray for Barakel as we prepare for summer. March 20, 2012 April 16, 2013 Kevin M. PierpontComments are off for this post. The past two weeks have passed by quickly. The previous weekend went well with couples on one side of the lake and teens on the other side. This past week started smoothly with my test Monday. 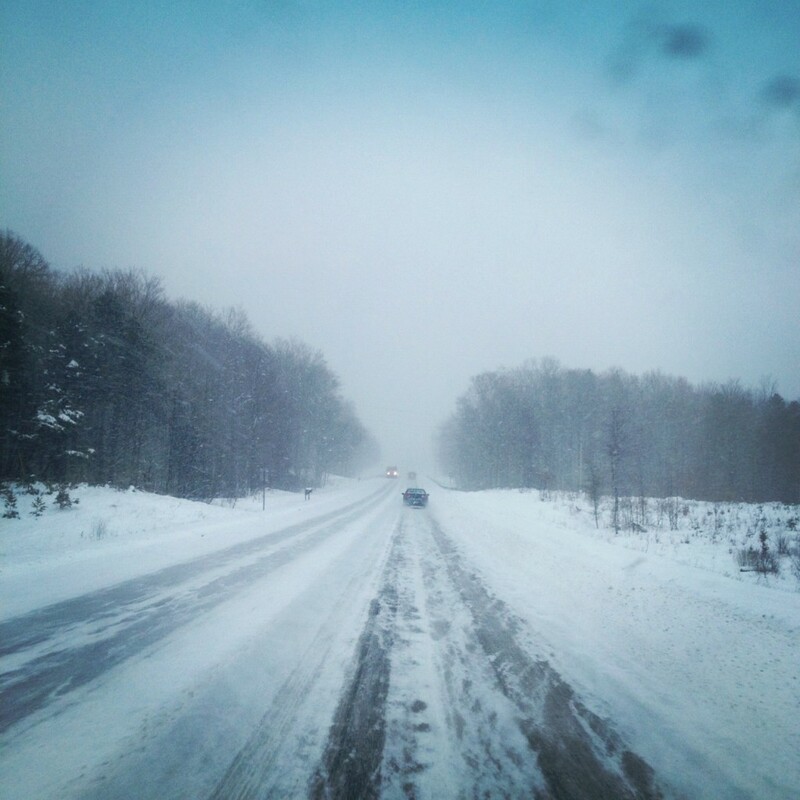 I rose early, got in my Jeep and headed west to Traverse City. The test was on “Environment and Humanity” and the subject material was Biology-meets-Humanities. I did well and passed the test, Praise God. Done with my test, I drove straight home to visit with my family for the day. 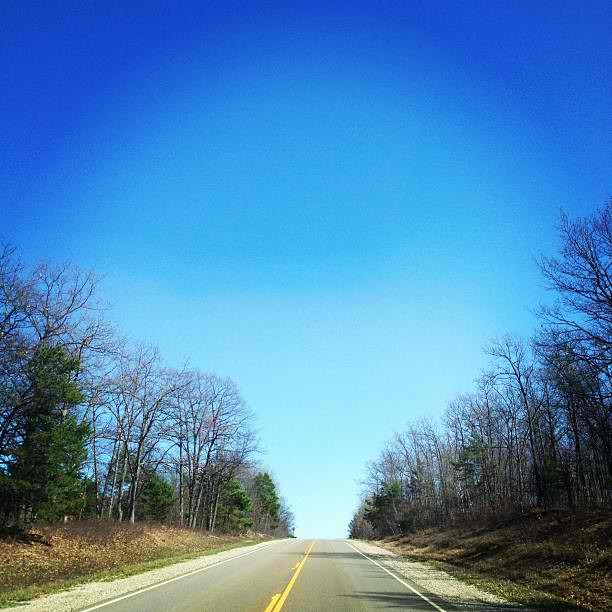 The sun was shining, the sky was a lovely blue, and the roads were perfectly clear, lending themselves to speedy traveling. I made it home in time for lunch. Coming home for the day after being gone for the past few weeks didn’t feel strange at all. It almost feels like I have hardly been gone. The afternoon was spent in reading, talking with my family and relaxing. 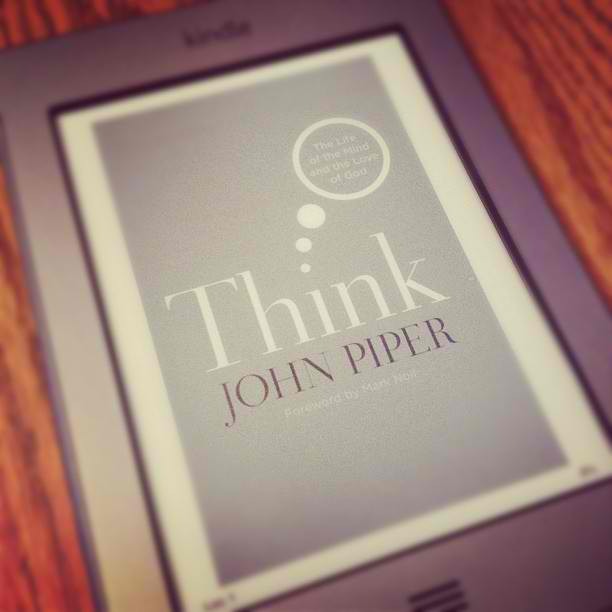 I finished reading on my Kindle a book that my dad bought me by John Piper called Think: The Life of the Mind and the Love of God. The book was very good and encouraged me to know God better, so that I may better love Him, through His grace. Also, my amazing mom gave me a tin filled with her fresh chocolate chip cookies to take back with me. They’re the best chocolate chip cookies in the world. 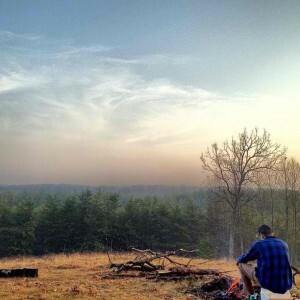 As I drove back to camp that evening I realized that Barakel has become to feel like my second home. The community of people here, the woods surrounding camp, and the ministry here all make for a place where I feel I belong. This season at Barakel has been a blessing. I plan on staying through the spring and on to summer, Lord willing. I’m excited about the possibilities. 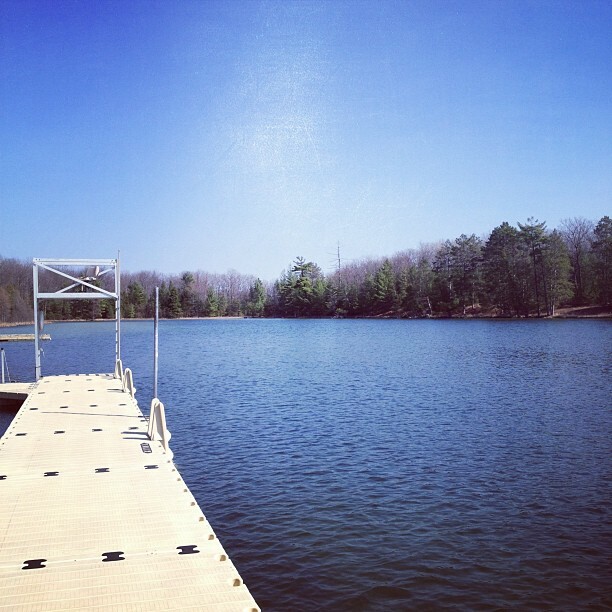 I’ll have a couple of weeks off during the spring, but other than that I’ll still be here at camp. Pray for me and the rest of the potential summer-staff as we prepare to be used by God in the lives of kids who come to camp. 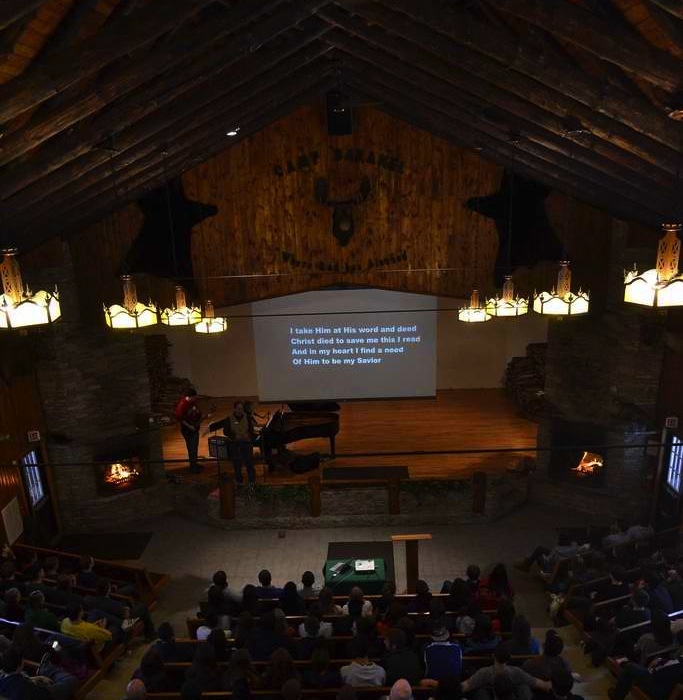 This weekend we had teens on both sides of the lake camping, and they all had chapel together in the large east side chapel. We had over 330 people in that combined chapel and it was incredible to see. Pray for the campers who were here that their time was one of spiritual growth and challenge. 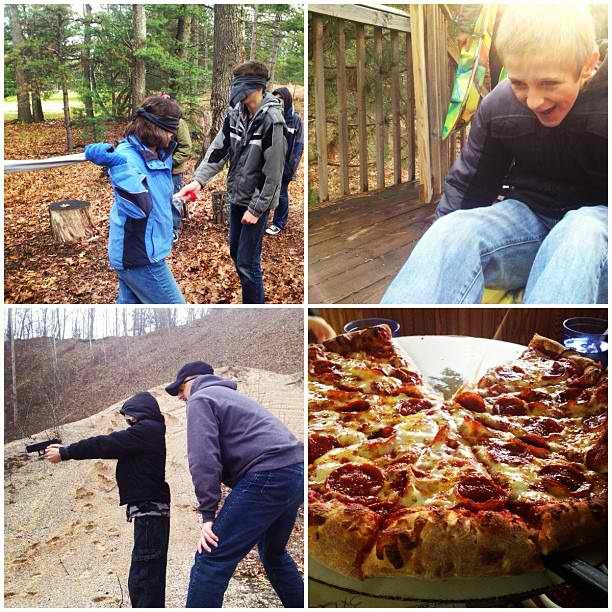 There are two more combined teen retreats left before the winter retreat season ends. Pray that we finish well and that camper’s lives would be changed. Also, a little fresh snow wouldn’t hurt either! February 20, 2012 April 16, 2013 Kevin M. PierpontComments are off for this post. Warm air and sunshine this week took a lot of our snow. Having no snow is a bummer when you run snow camp. But thankfully we retained enough to keep the tubing hill open, and had enough cold weather to keep the skating rink skate-able. 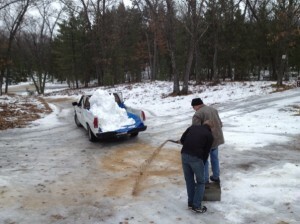 It took a little manpower and ingenuity though. To counter the loss of the snow we got a few of the guys together from around camp on Thursday, brought out two pickups and a big tractor with a snowblower and started hauling snow. The process really only took us half the day and we covered all the bald patches on the tubing runs. We went down to the RV park where we still had some good snow, blew it into the beds of the trucks, and then took it to the hill. The path up to the top of the hill was a bit icy so getting the pickups close to their destination was tricky, but with some skillful driving and sand the drivers made it. Reuben and Lee putting down sand on the path to the hill. The ice rink was also pretty sad looking, although it did have a solid base in spite of the weather. Friday night the temperature dropped low enough to lay down some good ice and Titus Brown and I put down a few sheets. Titus was a real trooper and stayed up late into the night making the ice smooth for the campers. 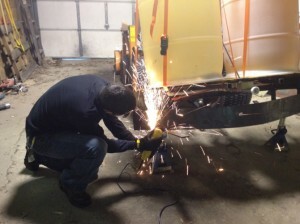 One of the projects I have worked on a little this week is the “zamboni” that we are making for the ice rink. It’s basically a tractor with two water barrels, a sprayer, and a giant squeegee to spread out the water smoothly. The zamboni is mostly together except for the squeegee part. Dan Haines helped get us started on the project by grinding away the extra metal in the way of the squeegee. Sparks flew and it looked pretty cool. Then I drilled holes for the rubber piece. All that’s left now is bolting on the rubber and seeing how it all works. Dan Haines going all out on the metal. You can't see from this angle but he has sweet shades. So in spite of the weather the campers seemed to have a good time. 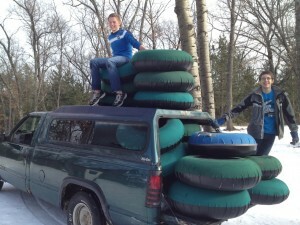 I helped out on both the thunder express Saturday in the morning, and the tubing hill on afternoon and evening. The evening runs were much faster when the temperature dropped on the tubing hill. I really enjoyed working the tubing hill and talking to the campers, and seeing their excitement as they sped down the hill. Spinning the tubers is my favorite, so I am always excited when they want to spin. I would smile when some of the younger daughters were bolder than their fathers and would spin while their dads would refuse my offers. 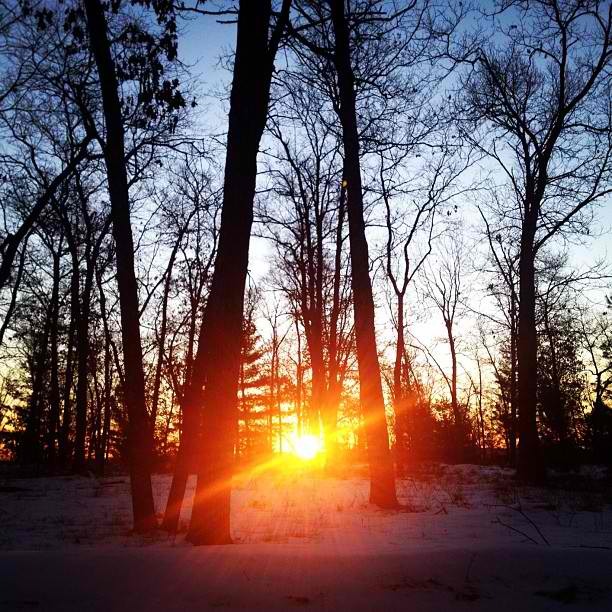 Even though things look a little bare around here, camp is going well and retreats all look pretty full. God is in control, so even though we want more snow, he knows whether or not we really need it! 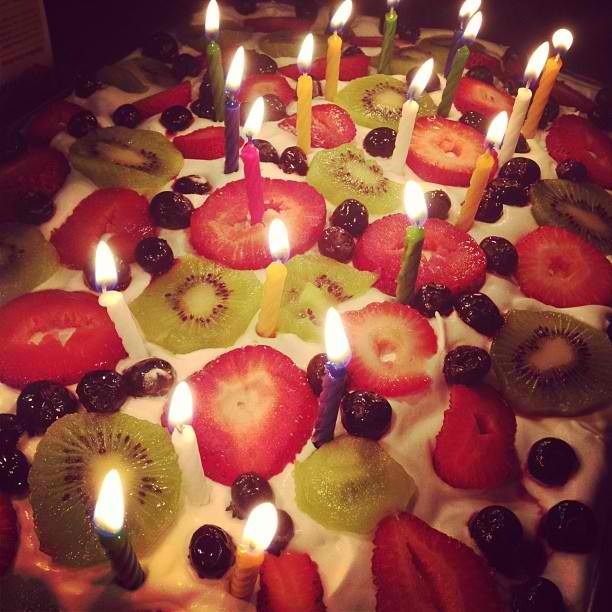 February 6, 2012 Kevin M. PierpontComments are off for this post. Daily life here at Barakel has begun to feel normal. I’m getting used to the schedules, the activities and the responsibilites. This past week I kept busy with chapel cleaning, ice-making, program work, and odd jobs. Temperatures were nice and low this week, except for on Thursday when it warmed up a bit and we lost some patches of snow. This meant that some of the ski trails had to be closed, but other than that all the activity areas kept enough snow to remain open. We even got a good blanketing throughout the weekend of the cold, fluffy flakes. At times the entire world looked like a snow globe. It was beautiful. Both sides of the lake had teenage campers from various church youth groups. West side had the Senior-highers and East side the Junior-highers. I worked on the West side with the Seniors. The speaker for the week on the West side happened to be my uncle, Ken Pierpont. Hearing my uncle speak was a treat. He’s one of my favorite speakers. My cousins Chuck, Dan, Wes, and Hope came along with him. My uncle’s oldest son, Kyle, was also up and had brought his youth group. So it was a regular old Pierpont reunion. I hadn’t seen either Kyle or Chuck for the longest time, so it was good catching up with them and the rest of the clan over the weekend. Sunday afternoon I went home for the first time in four weeks and was able to go to church with my family. Reuben came along and we stayed the night before leaving early the next morning for Traverse City. We brought my brother Luke with us and traveled to Northwest Michigan College for my test. “Art of the Western World” was the DSST test I took and thankfully passed. Even though the roads were a bit snowy, we made it back to camp mid-afternoon. I Praise God for more college credit and safe travels! Luke will be hanging out with me this week and helping with the work around camp. Luke is already taller than me and he’s not afraid to work, not to mention he’s a lot of fun to be around. We got a lot of work done today with his help! Luke and Reuben with a truckload of tubes that we moved this afternoon. While it’s hard to believe it, this is the mid-point of the winter retreat season here at Barakel. I guess time really does fly when you’re having fun! Keep praying for Camp and the campers that will hear the Gospel preached this weekend. Pray that hearts will be changed and an eternal impact will be made through the camping ministry here at Barakel! January 31, 2012 January 31, 2012 Kevin M. PierpontComments are off for this post. A white onslaught of snow and ice tried to hide the road as I returned back to camp midday Tuesday. I had passed my Astronomy test which I took in Traverse City that morning, and even though I was nervous about the test I did well. The roads on the way there had been clear. Not so on the way back. But God was gracious and I arrived back at camp late afternoon intact. The next day began with the weekly West Side chapel cleaning with Lee and Reuben, followed by Staff Fellowship. Barb – who has served in Africa for the past 30 years as a missionary and is now on staff here at camp for a year – shared her testimony with everyone. Hearing of how God had taken care of her through everything from wars to a plane crash was encouraging. All the staff had lunch together and then went back to work. The Hockey Rink with a fresh coat of ice. 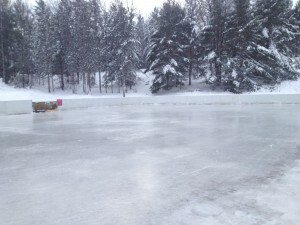 Ice skating is a highlight of the retreats for many, so making the ice and maintaining the rinks is a big deal. Jeremy Linsley shared his knowledge of ice making with me Wednesday afternoon and put me to work. I helped snowblow and then sweep off the ice. Thankfully both jobs are accomplished with tractors. We then put down a couple of fresh sheets of water on the ice. The job of ice laying is a little tricky as you have to try and keep the massively long hose from going over where you’ve already been, but I mostly got the hang of it. The rest of the week before the retreats started I spent doing various jobs around camp. The biggest of the jobs was snow removal. Thursday between a couple of snow shovels and a snowblower, Reuben and I cleared half of West Side camp. The ten-degree air kept us from overheating and we even had the joy of knocking down some huge icicles. The tubing hill is another highlight of winter at Barakel, and I had the privilege of helping run the hill for the first time Thursday night when we had people from the community come and tube. 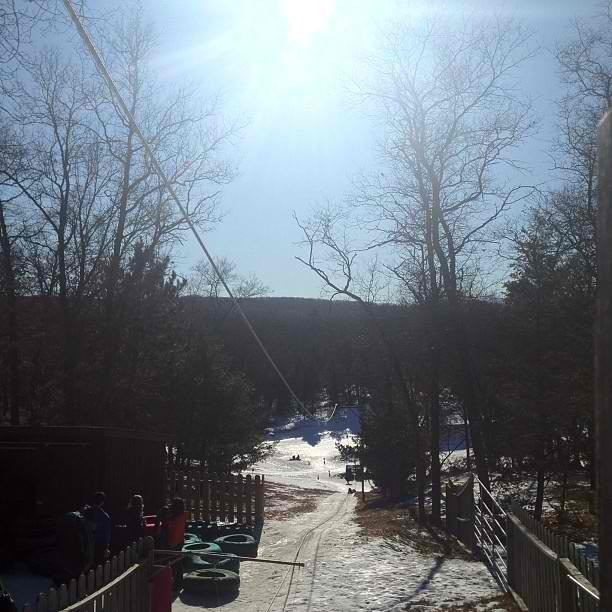 Tubing was fun to watch and I even went down the snowy hill for the first time. 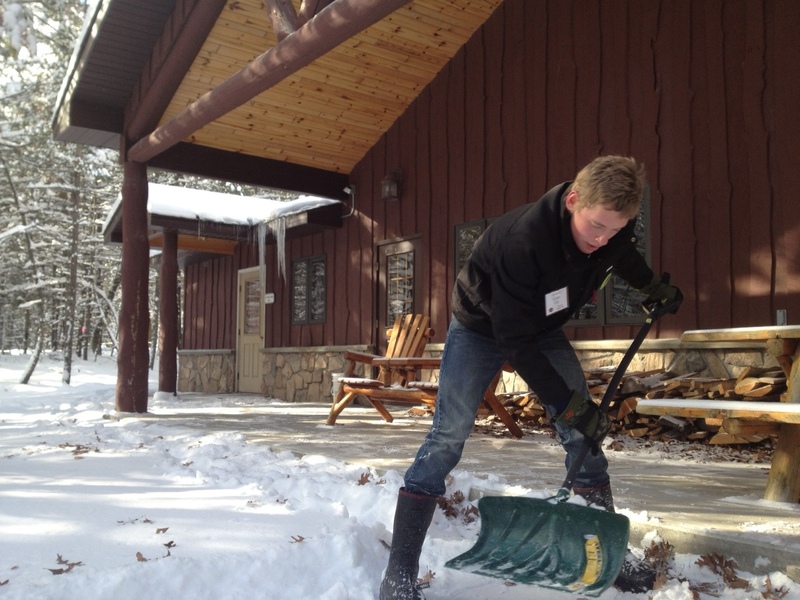 Reuben hard at work shoveling in front of a West Side lodge. The view early in the evening from the top of hill was amazing – Venus was shining brightly over a few black clouds on the horizon as the last tinges of sunlight faded away and night took over. It was a beautiful sight that I won’t soon forget. Friday evening the retreats started full swing and on the East Side it was our last Father-Son retreat of the winter. I saw four boys who all had been my campers over the past two summers and was able to meet and talk with their dads. It was a lot of fun. The weekend flew by and I was exhausted by Sunday afternoon when all the campers had left. So today has been spent mostly resting and catching up on sleep, but I will be back at it tomorrow morning! Pray for us at camp for our strength and joy as we serve for Christ’s glory. January 23, 2012 January 24, 2012 Kevin M. PierpontComments are off for this post.